Justin Martin, Writer - Go With the F.L.O. Welcome to my page devoted to Frederick Law Olmsted aka F.L.O. In the course of researching an Olmsted biography, forthcoming from Da Capo Press, I’m visiting a number of F.L.O.’s sites around the country. And I’ll be using this space to provide regular posts. 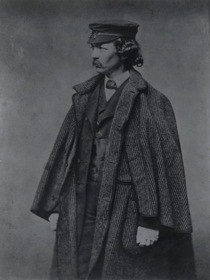 Olmsted had a mammoth career as a writer, abolitionist, Civil War hero, and pioneering environmentalist. He’s best known for more than 50 landscape architecture projects, everything from parks to university campuses to the grounds of several mental institutions. Following his wildly peripatetic footsteps is quite a task, but I’m making an effort to trace the trail of this American visionary. Hope you’ll enjoy these dispatches. The grounds surrounding the U.S. capitol remain remarkably true to Olmsted’s original plan. Amazing! You’d think some Senator would have snuck through a bill appropriating money for a really lavish monument on the grounds — or that Congress would have paved the whole area over to create really primo parking. While in Boston, had the opportunity to visit Fairsted (Olmsted’s home during some of the most productive years of his life) and McLean asylum (Olmsted’s home at the end of his life). Day 75 of the BP oil disaster. I’m visiting Boston’s park system, where Olmsted’s innovative Back Bay Fens — in particular — is a reminder that there are environmental solutions as well as environmental problems. Suburbs are ubiquitious today — and much maligned. But in 1868, when Olmsted did his masterful plan for Riverside, Illinois, a suburb was nothing short of a revolutionary new way of living. I’m in Chicago visiting the site of the 1893 World Columbian Expo. Traces of the original White City, as the fair was called, and of Olmsted’s dazzling landscaping plan for it are still visible today. People tend to view Niagara Falls as a natural wonder surrounded by manmade blunder. If not for Olmsted’s efforts, it would be a whole lot worse. Prospect Park has 45 — count ’em — 45 full-time employees. But an army of 6,000 volunteers helps tend this 526-acre greenspace in the heart of Brooklyn. Olmsted designed only two cemeteries during his long and varied career. One is Oakland’s Mountain View Cemetery. And boy, does it live up to its name. Knew my visit to Cali wouldn’t be complete unless I made a pilgrimage to Bear Valley, a town where Olmsted lived when he was a goldmine supervisor. But people tended to assume I was simply lost. I must mean Bear Valley, the popular ski resort.